The week before the latest UN’s world leaders’ conference there was another UN climate conference in Geneva where one of the UN’s own leading climate scientists and computer modellers, Professor Mojib Latif from Germany’s Leibniz Institute of Marine Sciences at Keil University, stated that from recent research he has conducted he has had to conclude that global warming has ceased. It reinforces what others have been saying for a while now and questions the need for any action to be taken at all on combating global warming. There is no need for carbon taxes, no need for an emissions trading scheme, no need to seriously undermine the country’s economy to combat something that is not happening. The statement also acquits CO2 of the charges laid against it; as it is impossible for it to be forcing warming when actual temperatures are cooling and are predicted to continue, in spite of increasing CO2. All of this begs the question . . . what actually causes temperature fluctuations on a global scale? The obvious answer is solar variation, but this probably is only part of the answer. Climate is a far more complex scenario than we have been led to believe and one small contributing factor is outweighed by all of the more substantial contributors. The concept that the science is settled is also refuted by this statement. 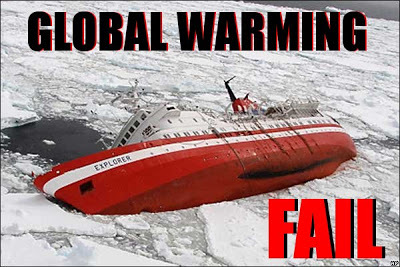 If a promoter of global warming has found evidence contrary to his convictions then it simply cannot be settled and obviously requires more study. This sort of acknowledgement should make politicians question the path they are taking and maybe just come out and state that the whole business is shelved until clarification is confirmed one way or another, instead of relying on outdated and obviously unreliable information to justify their actions. I congratulate our councillors who have decided not to sign the local government leaders’ position statement on climate change and especially applaud those who have spoken out against the supposed human causes of climate change; keep up the good work. Gisborne might just lead the country on this rising tide of sensibility and hopefully our national politicians will soon follow us. The truth is, governments will continue to put in place extremely ill thought out climate change legislation in the hopes something good will come from it. This is just bad way of governing and should also be heavily discouraged. It is obvious that the climate and the contributing factors there of require substantially more study for understanding before we make any decisions that actually might end up being even more harmful then doing nothing.